Insulation resistance testing is performed when troubleshooting electric motors and related equipment. IEEE Standard 43-2000, Recommended Practice for Testing Insulation Resistance of Rotating Machines, recommends the insulation test voltage to apply, based on winding rating, and minimum acceptable values for electric motor windings. 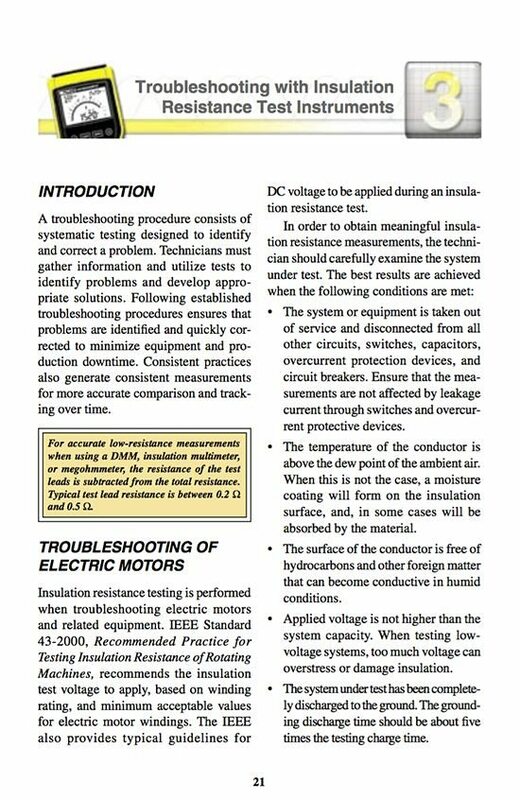 The IEEE also provides typical guidelines for DC voltage to be applied during an insulation resistance test. In order to obtain meaningful insulation resistance measurements, the technician should carefully examine the system under test. The system or equipment is taken out of service and disconnected from all other circuits, switches, capacitors, overcurrent protection devices, and circuit breakers. Ensure that the measurements are not affected by leakage current through switches and overcurrent protective devices! The temperature of the conductor is above the dew point of the ambient air. When this is not the case, a moisture coating will form on the insulation surface, and, in some cases will be absorbed by the material. The surface of the conductor is free of hydrocarbons and other foreign matter that can become conductive in humid conditions. Applied voltage is not higher than the system capacity. 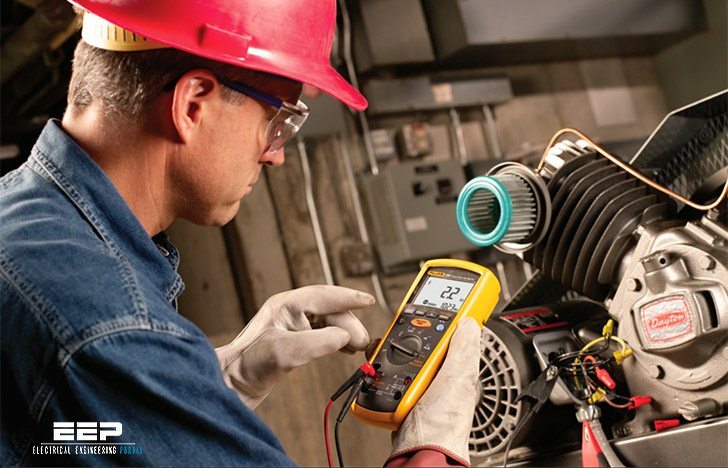 When testing low voltage systems, too much voltage can overstress or damage insulation. The system under test has been completely discharged to the ground. 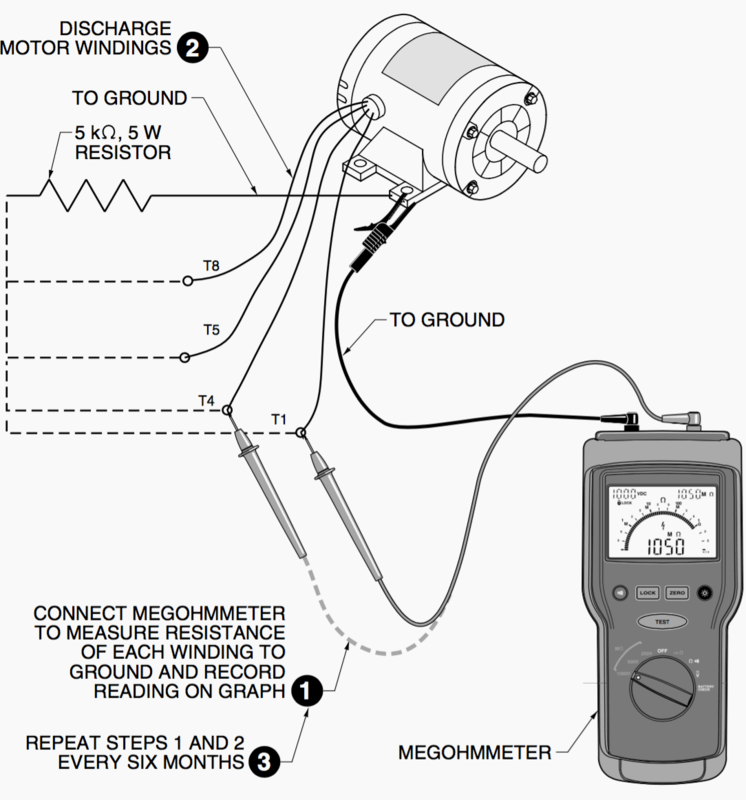 The grounding discharge time should be about five times the testing charge time. The effect of temperature is considered. Since insulation resistance is inversely proportional to insulation temperature (resistance goes down as temperature goes up), the recorded readings are altered by changes in the temperature of the insulating material. It is recommended that tests be performed at a standard conductor temperature of 68°F (20°C). When comparing readings to 68°F base temperature, double the resistance for every 18°F (10°C) above 68°F or halve the resistance for every 18°F below 68°F in temperature. For example, a 1 MΩ resistance at 104°F (40°C) will translate to 4 MΩ resistance at 68°F (20°C). We are seeking the guidelines for Lightning protection Assessment in the moderate atmosphere of Lahore, Pakistan. If possible/available share with me the lightning strike statistics of this area.